2010 - Paregentan and Diaruntarch come together on one day. Sermon by Fr. 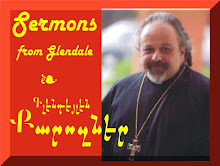 Vazken Movsesian about the Lenten period of discipline. Recorded LIVE at the Youth Ministries Center in Glendale on February 14, 2010. English language sermon (when translation system went down). 2010 - Paregentan and Diaruntarch come together on one day. Sermon by Fr. Vazken Movsesian about the Lenten period of discipline. Recorded LIVE at the Youth Ministries Center in Glendale on February 14, 2010. Armenian Language.